Newhouse students find the most difficult part of their broadcast journalism classes is finding story ideas. And it is tough. 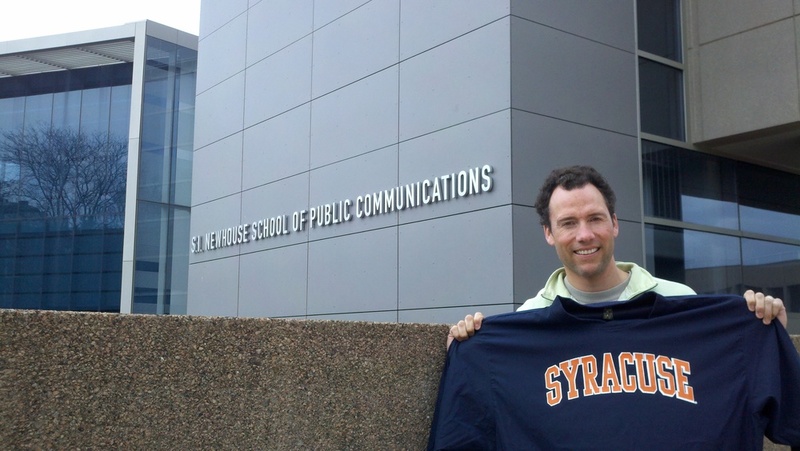 One strategy Department Chair Chris Tuohey promotes is looking at what journalists in other markets are covering and then seeing if those stories would work in Syracuse. That's how I found today's story. I started looking for story ideas several weeks before I arrived in San Francisco. One fun story that ran in the local Syracuse paper was about Goat Yoga. Yes, just what you think it is - yoga with goats. So I did a Google search and, to my surprise, there was no goat yoga in the Bay Area. For all the "out there" stuff that happens in San Francisco, this wasn't happening. I did a new search for "Bay+Area+goats" and found the farmer's market in Oakland recently had a goat festival. I called the public relations person for the farmer's market, and she said, "Yeah, we worked with City Grazing." I then called City Grazing and, lo and behold, yes, they were setting up a goat yoga program with their Yogoats. Their first sessions are in a couple of weeks, so my story was an exclusive preview. The organizer told me over the phone: "I was waiting for someone from the media to call. You're the first." I asked her to arrange a practice session for me and we agreed to meet. So what (what difference does it make): A national craze is coming to the Bay Area. Real people: people organizing the yoga classes. Show me don't tell me (video): goat yoga. Shooting the video was a breeze because the yoga participants and the goats were so cooperative. Except for this shot. Notice how the picture starts shaking in the middle. What's a videographer to do? The little guy was just begging for some attention. Surprises: Rather than jump right in, I let the goat part of the story come a little later. To start, I used a lot of closeup shots of the participants doing yoga that wouldn't reveal what was going on until we were already into the story. Surprises are great for storytellers because viewers remember them. A lot of times the inverted pyramid is the way to go - start with what's most important right off the bat. But when you can, you should try to save the point of the story for later; it makes the story more memorable. Parallel parking: Hat tip here to KARE TV master storyteller and reporter Boyd Huppert. If you want to learn how to do great TV, watch Boyd's stuff; go listen to him talk. This technique, he says, "is a way to stay in the moment." The idea is to park parts of your voice track in between what the interview subject says. Watch THE STORY below and you'll find it during one of the yoga moves. Lots of students ask "What should I wear when I'm reporting?" I'm a little old school, so I advocate dressing up. Jacket and tie; the equivalent for women. The reason is I want people to take me seriously. We all get dressed up for important moments in our lives. It sends a message. However, there's a caveat to that. What we don't want is to distract the viewers with our attire - it must be appropriate for the circumstances. So, when you're reporting on a typical Syracuse blizzard, it would be distracting if you were out there in a sports coat or blouse instead of a parka and hat. Wear what's appropriate. That's why I went home and changed after I knew I'd be goating today. One of the best storytellers of all time, Tom Wolfe, said when he's reporting he flips on the awareness switch. He makes a conscious effort to be hyperaware of what's going on around him. MMJs should do that, too. Take notice of your surroundings, what you read, what you see on TV. Story ideas are everywhere if you just look for them. Seek out the industry experts, the folks who have been doing this for a long time. They've got tips on how to tell a better story. You can apply them if you know what they are. Don't distract the viewers with what you wear. Err on the side of formal, but dress appropriately.